For our fourth day on Eleuthera, we had the opportunity for some sight-seeing and touring across the island. Our first stop was to the new Centre for the Arts that is being built in Tarpum Bay, an area that will soon hold an outdoor amphitheatre and stage. In fact, this very stage will hold a concert for Earth Day this coming year with a variety of well-known American artists. While construction is being completed on this new addition to the area, we were also able to see where time has stood still on another part of the island. Part of our tour included visiting the abandoned VentaClub, an Italian resort/club that was abandoned decades ago due to lack of sustainability. As we walked through the remains of the resort, we saw a once beautiful property with direct access to the soft sands of the Atlantic Ocean. Unfortunately, the lot was deserted, and is now only minimally maintained by one sole caretaker. VentaClub is not the only abandoned resort on the island; farther down, there is also a deserted and overgrown Club Med that was once a popular, elegant place for tourists. However, neither of the resorts was properly built for sustainability on the island, and eventually both were simply left as empty buildings. Despite seeing these beautiful shells of a wealthy time once past, we also saw that many people on the island are busy working hard towards promoting sustainability and sustainable projects on the island. In addition to the new Arts Centre being built in Tarpum Bay, we also visited the Leon Levy Native Plant Preserve. This area is a 25 acre stretch of land that was renovated through a donation by Mr. Leon Levy to be a preserve to a large variety of native plants, and even some animal species. During the tour, we saw numerous plants that are used for natural bush medicine in Eleuthera, such as certain leaves that one would make into a tonic or tea in order to cure different problems like colds or the flu. In addition to the growth that we were able to see at the Native Plant Preserve, we were also able to see the work the community has done for their own volunteer fire station, which also houses the area’s ambulance. Shaun Ingraham, one of the top community leaders, and the contact from Island Journeys that sets up the Bahamas alternative winter break trips for Emory, even took the student nurses on a special trip on top of the fire truck. Shaun has been incredibly helpful to us the entire time we’ve been here, and has let some of the students stay in his childhood home throughout the trip. Although, I think he may have a special place for Emory in his heart, as he is a master’s graduate of Emory University’s Candler School of Theology. After the excitement of taking our first ride on a fire truck, we traveled farther up north to a unique, historical spot known as “Preacher’s Cave”. The specifics behind Preacher’s Cave vary, but the general story is that it is the original founding spot of the Bahamas. There were missionaries traveling throughout the Atlantic Ocean who wrecked their ship on a dangerous spot near Eleuthera called “Devil’s Backbone.” When they survived the shipwreck, they took cover in a nearby cave that came to be known as “Preacher’s Cave.” This is the spot considered to be the founding place of the Bahamas. Finally, we were allowed a very special treat to attend the Eleuthera Rotary Club’s meeting, where some of the strongest and most progressive leaders in the community meet monthly to discuss community needs and goals. Dr. Thomas has been working with a variety of the Rotary Club members for a number of years now, and they were very excited to meet another group of her nursing students. We all loved the warm, good-humored atmosphere that the members kept even while discussing important events on the island. It was refreshing to see so many people coming together with honest, sincere interest in bettering the island of Eleuthera. And, as we have noticed is custom on Eleuthera, we were made to feel right at home amongst all of the most important members of the community, and like they truly appreciated our work here. I think all of us felt proud of not only ourselves as Emory nurses, but also of the Bahamian nurses that we have learned so much from throughout this journey. Today was our third day on Eleuthera, Bahamas. During the morning, my group was sent to Tarpum Bay to work with the nurses in the clinic there. The majority of the clinics in Eleuthera serve a variety of different patients, and they attend to numerous ailments. Each day, they typically have one type of service offered (such as a well-baby clinic day, a day for general ailments, and a day to see the doctor). Wednesday is their well-baby clinic day, so we were able to work with many different children coming in for general check-ups and vaccinations, although some sick children also came in. Once again, the nurses here had to do the initial intake of the patient, assess the child, and then either provide a treatment in the office, or prescribe the appropriate medication to go home with the child. I am continually amazed by the amount of work that they have to do, and the knowledge they must to possess in order to do that work effectively. After we finished our nursing work during the well-baby clinic (where we made friends with many adorable, tiny patients), we went with the nurses to do two home visits. These home visits are done approximately once a month for patients who are unable to come into the clinic for whatever reason. The nurses go to their houses, perform a general assessment, and determine what the patient’s plan is for the upcoming weeks. One of the aspects of these visits that I found most special is how much the nurses know about the patient’s social history and family history. As one nurse put it, “everyone knows everyone on Eleuthera. Well, almost.” Both patients seemed especially appreciative and happy to see the nurses as they came in to care for them. I was impressed by the way the nurses incorporated their knowledge of the patient’s family history (such as their brother, father, or grandfather having hypertension, diabetes, cancer, etc) into the planning for the patient. The community of Eleuthera is so tightly knit together, and it seems to truly pay off not only through increased social interaction, but also healthcare planning. Finally, at the end of the day, we were surprised by a special visit at our house by some of the local neighborhood children. They came up to our door twice and gave us various little “presents”, such as flowers, berries, and a bracelet. Their kindness and generosity shocked us, and I know it touched my heart. We didn’t have much to offer them in return, but they really weren’t even expecting anything of value from us… They seemed excited when we were able to give them some of our stickers from our previous days of teaching in the schools. We were once again shown how caring this island is, especially in our community of Tarpum Bay. The Bahamians on this island truly have a way of making everyone feel at home, and like we’re part of their family. Today was our second day in Eleuthera, where we are volunteering in clinics and schools across the island. My group was sent south on this very long, skinny, beautiful stretch of land to Rock Sound primary clinic and Rock Sound primary school. While at the clinic, we did intake reports on a variety of patients and were able to see some of the common ailments that day: rashes, influenza, back pain, etc. All of the patients seemed incredibly welcoming, receptive, and trusting of us, despite the fact that some of our group are still in the undergraduate nursing program. We were given as much respect as the other healthcare staff (doctors and nurses) in the clinic. During the second day, we were able to spot the continuing theme of autonomy among the nurses of Eleuthera. We were surprised to realize that they function in a variety of rolls, ranging from general nurse, to a sort of nurse practitioner, to pharmacist, to social worker, to friend to all of the patients… (not to mention that the majority of them are also mothers, and sometimes grandmothers, with their very own families to care of as well). I have so much respect for these women and what they are able to accomplish every single day; they never seem to have a minute to spare, and they never waste a minute either. I plan to keep them in my memory when I’m feeling bogged down by finals, clinicals, and work. There are nurses here doing so much more than I could ever have imagined with the limited supplies that they have. In addition to our wonderful clinic experiences, we also have gone to a couple of different schools from different parts of the island. In one school, we assisted with health screenings of different classes. At the Rock Sound primary school, we gave a presentation on healthy eating and healthy diets to follow. Eleuthera has recently had some issues with a high rate of obesity, as their main food staples are heavy in grains and meat. However, we found out very quickly that these young children (ranging from ages 6-12) are quite well-informed about healthy diets; the issue seems to lie more in access to more fruits and vegetables, and the costs of these items. Another theme we’ve noticed across the island is that of the warm, caring, respectful, good-hearted nature of all the children. While many of us have worked with children previously, and are fond of their sweet ways, we were shocked not only by how respectful and polite these children of Eleuthera were, but also how loving they were. We were given so many hugs and compliments by them, and they were very interested and engaged in all of the work or teaching we did. Almost everyone wanted to listen to their heart or their friend’s heartbeat. They were also interested in taking lots of pictures with us and their friends. Each day that we left, they asked us with huge smiles on their face, “are you coming back tomorrow to see us?” It made me a little sad to let them know that no, I personally wouldn’t be coming, but that some of my friends would for the rest of the week. Some of the older students even asked to be FaceBook friends with us, as opposed to pen pals. It must be a sign of the times and our generation, no matter where you are in the world! Finally, at the end of the day, we got an hour or so for some relaxation time to take a walk on this beautiful Caribbean beach. As we walked up and down the sand, we were greeted with a friendly “hello, how are you?” or a polite “good evening” by almost everyone we passed. At first, it seemed a little ‘off’ to me…almost a little unnerving for someone to be that friendly without wanting something else from a passerby. Then, I thought that I was probably the one that was a little ‘off’ or out of touch with my people in my own home. I think it’s very easy to take for granted politeness and friendliness in a big city in America; it seems that honking horns, avoiding formalities, and sometimes even rude remarks are the norm there. Here, the people are just truly friendly, caring people. They’re honestly interested in how you’re doing, and they want to make sure you’re enjoying your stay on their small little island, that’s so full of culture and life. As we watched the sun set over this Bahamian island in the Caribbean Sea, I think all of us felt a little more connected with the earth, each other, and everyone on this island. Living in a place like this, I can see why so many people have smiles on their faces all day. I can’t wait to see what excitement, adventures, and interactions tomorrow will bring! 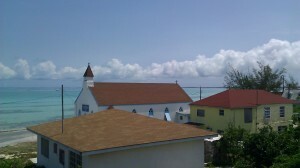 Our journey in Eleuthera, the Bahamas began on Saturday with our arrival onto the island. It is a beautiful island with stunning beaches and gorgeous crystal clear water. In our first few days, we were immersed in Bahamian culture – going to church, visiting the beach, taking part in a Bahamian Homecoming and enjoying local food. We also have seen some of the health disparities that exist on Eleuthera: lack of consistent power and potable water in some communities, dumping trash on the sides of the road and the beaches, and the expense of food that is mostly imported, to name a few. One of our main goals while here is to evaluate what the Bahamian communities we are partnering with hold as priorities for their health and then assessing what the strengths and areas of growth exist. The community leaders gathered together today to discuss the ideas for One Eleuthera – an overarching program to join together and unite all the health programs on the island. Many of the themes that arose during the meeting centered around emergency care for Eleuthera. The South Eleuthera Emergency Partners (SEEP) is a group of citizens that is committed to emergency care in the southern part of the island. There is an emergency program for the central part of the island called HACE. And in the northern part of the island, emergency care is dependent upon the separate settlements. These agencies along with several other health organizations make up the health initiatives on the island. Our plan right now is to evaluate several of these programs in the next week and then to explore how well these programs are promoted and utilized in the communities. Today our group went out in pairs and trios to four of the island’s clinics. Everyone had a little bit of a different experience, but each one of us enjoyed a rich day of learning about the Bahamian health system and growing as student nurses. I had quite the adrenaline rush when I was doing intake with one patient, and the patient began to have a seizure. As he fell toward me, I was able to lower him to the ground, make sure he had an open airway, and hold his head as he continued to seize. Since the doctor was at our clinic, we were able to transfer the patient to the “Emergency Room” (a small room off of the waiting area) where he was well cared for over the next few hours. It was a very heart-pumping experience! I’ll leave you with a picture of the beautiful landscape.